From meandering to hiking across what feels like endless, quiet hilly pastures in the rain, the grass really is greener on the Midlands' side. Green is the warmest colour in the Natal Midlands. The weather can be tumultuous - one day it’s 35°C , the next an icy 15°C. Sunny, then misty. But, really, it's warm, in the comforting sense of the word. You allow its up and downs, its unpredictability, because it’s clean, it’s fresh, it’s best. Green blankets of grass as far as the eye can see wrap around the Brahman Hills estate. Meet in the Midlands. A quick hour from Jozi and two-hour flight from Cape Town; and then another hop, skip and 2 hour scenic ceremony of a ride (mostly for the eyes) past The Valley of a 1000 Hills, and you’re there. Yes, this might just be where friends living in separate South African cities should meet. 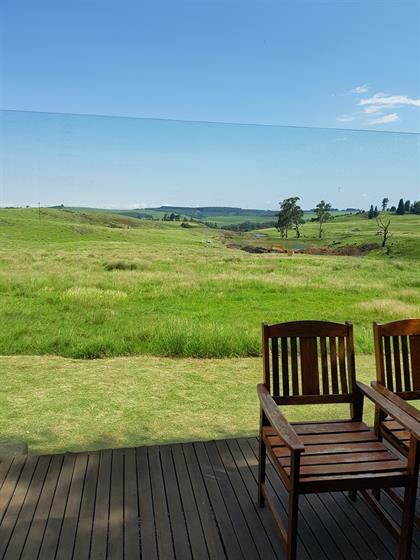 Situated in the heart of the KZN, Brahman Hills is a destination that couldn’t be more hospitable to events like weddings, birthdays, girls’ weekends away, family reunions and romantic stays. The hotel and self-catering accommodation include extensive facilities like a spa, restaurants, a coffee bar, underground bar and restaurant, as well as a variety of eventing venues seating from 10 to 400 people. Sat next to the N3 highway, its home is the Blue Crane Nature Reserve which is easily accessible and central to the popular Midlands Meander tourism route. Four-star cottages overlook the endless grasslands dotted with Zebra and buck happy to say “Hello” as they graze close to your deck. Indulge in a bit of pruning in the jacuzzi, allowing yourself to be, to indulge. Sleep, drink wine, eat fresh farm-style pies and delights at The Windmills Kitchen sat next to the property. Spoil your senses with fine dining at the underground 89 Copper eatery or pamper yourself with a rejuvenating treatment at the spa; closer to a GET-A-AWAY, you can’t get. And what’s the Midlands without a meander? Meander doesn’t mean ‘to caffeinate’. But caffeinate, you will. From the famous Terbodore Coffee, to Steampunk Cafe and Lineage Coffee, the Midlands won't leave you drowsy, that's for sure. Early morning walks or jogs start the day. Get up, and get out there. Come rain, shine or mist, the hills are alive with the sound of silence. Stroll past Brahmans and Nguni cows munching on wet grass on one hillside, while overlooking the forever-ness of the valley reminiscent of a scene stolen from Wuthering Heights. And it's right here in South Africa. For more on Brahman Hills stays, go here. *Marisa Crous was hosted by Brahman Hills for 3 nights.